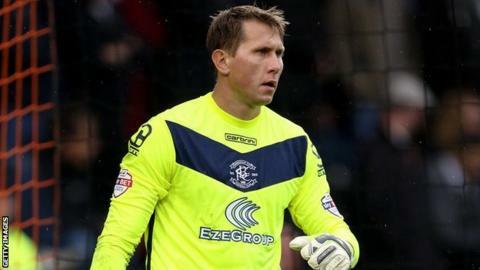 Birmingham City should not see the end of their winning run as too much of a setback as far as their Championship promotion ambitions are concerned, says goalkeeper Tomasz Kuszczak. Sixth-placed Blues had won four games in a row before losing at Hull, but are only one point off second place. "We are still in good form and very focused," Kusczcak, 33, told BBC WM. "There are many games to go and if we keep working like we are we'll be in a very good position." After seeing off Brentford, Leeds, QPR and Bolton, Blues lifted themselves into the second automatic promotion spot but came unstuck at the KC Stadium, going down 2-0 on Saturday to their high-flying rivals. But the former West Bromwich Albion, Manchester United and Wolves keeper, who moved to Birmingham in the summer, says they have to take the end of their impressive run on the chin. After winning the last three games of 2014-15, Birmingham City won five and drew two of the first seven matches in all competitions this season. Their run of four Championship wins in a row was the first time they had done that in the same season since doing it twice when they reached the play-offs in 2011-12. "After four good games everyone thought we were going to have a fifth one but we have to respect the result," he added. "In the past few games we've been really clinical but we didn't take our chances." Blues face 14th-placed Wolves in a West Midlands derby at St Andrew's on Saturday and Kuszczak is already looking forward to facing his former club. "There are few clubs in the Championship I've played for but I'm looking forward to it and seeing some friends," he said. "It's going to be difficult - they have a lot of power and they are quick."